A highly regarded academic and research institution, the California Academy of Sciences was established in 1853 to explore and explain the natural world. Located in San Francisco’s Golden Gate Park, the organization has an aquarium, a natural history museum and a planetarium in its 400,000-square-foot high-tech facility. Visitors can explore the ever-changing and intertwined relationship between humans, the planet and nature. There are a variety of hands-on displays, live animal exhibits and planetarium shows. The Steinhart Aquarium features a four-story, spherical enclosure that replicates the lush environment and climate in the world’s rainforests. Other exhibits feature a colorful Philippine Coral reef, the marine habitat along California’s northern coastline and the penguin colonies that inhabit Boulders Beach near Cape Town. The swamp exhibit is home to 149-pound Claude, an albino alligator. A popular exhibit in the Kimball Natural History Museum is the Foucault pendulum, which demonstrates that the earth spins on its axis. The earthquake exhibit explores the science behind this phenomenon and provides an amazing glimpse at San Francisco’s major seismic event in 1906. The Morrison Planetarium is the largest digital facility of its kind in the world. The planetarium features state-of-the-art technology that enables guests to take virtual tours of the cosmos and distant galaxies. Completely rebuilt in 2008 after Loma Prieta earthquake, the facility has several green energy features, such as solar panels and a living roof. One of the largest natural history museums in the world, the Academy entertains approximately 1.6 million visitors each year. A four-story, spherical enclosure enables guests to experience the flora and fauna of rainforests from around the globe. There is an acrylic passageway that leads you across a flooded Amazonian riverbed with fish swimming overhead. The Foucault pendulum and Earthquake are popular exhibits. You will see firsthand how a pendulum proves that the earth spins. A multimedia show and bone-rattling simulator allow visitors to experience the catastrophic 1906 fire and earthquake. Other highlights include penguins in the Africa Hall, an albino alligator in the Swamp, a menacing Tyrannosaurus rex, planetarium shows and a live coral reef. 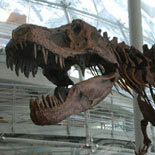 The Academy rotates 20 million specimens and artifacts along with other visiting exhibits. Trusted Tours and Attractions provides deep discounts to groups of 10 or more. For more information, please complete our Group Sales Form.